Rheology is, by common consent, a difficult subject and some of the theoretical components are often viewed as being of prohibitive complexity by scientists without a strong mathematical background. There are also the difficulties inherent in any multidisciplinary science like rheology for those with a specific training. Therefore, newcomers to the field are sometimes discouraged, and for them the existing texts on the subject - some of which are outstanding - are of limited assistance because of their depth of detail and highly mathematical nature. This book introduces the subject of rheology in terms understandable to non-experts and describes the application of rheological principles to many industrial products and processes. 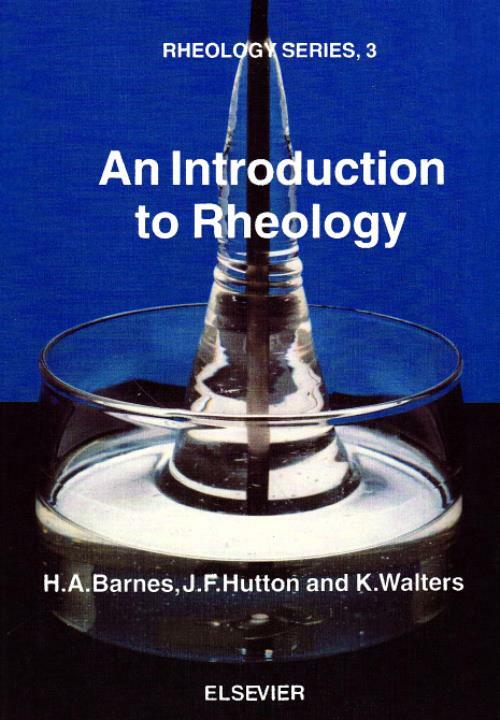 It provides a simple but authoritative guide which shows clearly how mathematics, physics and chemistry have contributed to the development of rheology. The generic features of all liquid-like materials are summarised, i.e. viscosity, linear viscoelasticity, normal stresses and extensional viscosity. Particular systems are then discussed, i.e. polymeric liquids and suspensions. The final chapter gives an outline of the theoretical advances which have been made. Consistent notation and nomenclature have been used throughout the book, and the key textbooks and publications which will enable the reader to follow up particular topics are listed. 1. Introduction. What is rheology? Historical perspective. The importance of non-linearity. Solids and liquids. Rheology is a difficult subject. Components of rheological research. 2. Viscosity. Practical ranges of variables which affect viscosity. The shear-dependent viscosity of non-Newtonian liquids. Viscometers for measuring shear viscosity. 3. Linear Viscoelasticity. The meaning and consequences of linearity. The Kelvin and Maxwell models. The Relaxation Spectrum. Oscillatory shear. Relationships between functions of linear viscoelasticity. Methods of measurement. 4. Normal Stresses. The nature and origin of normal stresses. Typical behaviour of N1 and N2. Observable consequences of N1 and N2. Methods of measuring N1 and N2. Relationships between viscometric functions and linear viscoelastic functions. 5. Extensional Viscosity. Importance of extensional flow. Theoretical considerations. Experimental methods. Experimental results. Some demonstrations of high extensional viscosity behaviour. 6. Rheology of Polymeric Liquids. General behaviour. Effect of temperature on polymer rheology. Effect of molecular weight on polymer rheology. Effect of concentration on the rheology of polymer solutions. Polymer gels. Liquid crystal polymers. Molecular theories. The method of reduced variables. Empirical relations between rheological functions. Practical applications. 7. Rheology of Suspensions. The viscosity of suspensions of solid particles in Newtonian liquids. The colloidal contribution to viscosity. Viscoelastic properties of suspensions. Suspensions of deformable particles. The interaction of suspended particles with polymer molecules also present in the continuous phase. Computer simulation studies of suspension rheology. 8. Theoretical Rheology. Basic principles of continuum mechanics. Successful applications of the formulation principles. Some general constitutive equations. Constitutive equations for restricted classes of flows. Simple constitutive equations of the Oldroyd/Maxwell type. Solution of flow problems. (Chapters include an Introduction). Glossary of Rheological Terms. References. Author Index. Subject Index.